The system checks for opening of the vehicle. The system checks for any variation in the volume in the passenger compartment. The alarm is triggered if anyone breaks a window, enters the passenger compartment or moves inside the vehicle. The system checks for the putting out of service of its components. The alarm is triggered if the battery, the central control or the wires of the siren are put out of service or damaged. Press the locking button on the remote control. The monitoring system is active: the indicator lamp in the button fl ashes once per second. After the locking button on the remote control is pressed, the exterior perimeter monitoring is activated after a delay of 5 seconds and the interior volumetric monitoring after a delay of 45 seconds. If an opening (door, boot...) is not closed fully, the vehicle is not locked but the exterior perimeter monitoring will be activated after a delay of 45 seconds at the same time as the interior volumetric monitoring. Press the unlocking button on the remote control. The alarm system is deactivated: the indicator lamp in the button goes off. Within ten seconds, press the button until the indicator lamp is on continuously. Press the locking button on the remote control immediately. The exterior perimeter monitoring alone is activated: the indicator lamp in the button fl ashes once per second. Press the unlocking button on the remote control to deactivate the exterior perimeter monitoring. 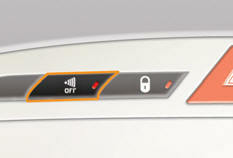 Press the locking button on the remote control to activate all the monitoring functions. The indicator lamp in the button again fl ashes once per second. When the ignition is switched on, fixed illumination of the indicator lamp in the button indicates a malfunction of the system.